The actual hunt for this buck lasted all of: 60 seconds, but the memories made will last a lifetime. The morning of October 25, 2016 started as mine usually do – getting my kids out of the house and off to school. Except this morning, I didn’t have to continue on to work. Instead, I had taken the day off and had to head to one of my two hunting properties to retrieve a doe my son and I and hit the night before. For this, I asked my Dad to tag along for some help and hunting companionship. Days like these are rare. Dad and I don’t have time to spend alone hunting like we did back in the glory days of my upbringing. Now it’s me and my wife who are raising children and teaching them the art of hunting and the respect for the great outdoors. Once scooping Dad and hitting the road for school drop-off, I noticed an SUV pulled to the side of the road adjacent to our home property. I rolled down the window and could see the damage to the vehicle. The driver soon confirmed that he’d hit a deer, but wasn’t sure what it was or if the animal was fatally wounded. We exchanged pleasantries and continued on our way. After dropping my son at school, Dad and I soon arrived at our property in Livingston County where I had shot the doe the night before. It took us approximately :30 minutes to locate the downed whitetail. However, upon walking up to the doe, I soon realized we weren’t the only ones who had discovered the kill. Coyotes had beaten us to the scene and had devoured the venison I was so looking forward to depositing into my freezer. Gosh, I dislike coyotes. With a disappointing ending, Dad and I hopped back in the truck to return home. On our ride back I suggested to Dad that we do the ethical thing and check the area where the gentleman had struck the deer hours before to ensure the animal wasn’t laying in the brush suffering. Dad agreed and we formulated our plan. Upon arriving back to our Ontario County property, I grabbed my bow and gear. Dad and I made the short walk through our property to the neighbor’s lawn where the man had told us the deer was seen flopping around after he’d struck it. We began searching the edge of the road and the perimeter of the lawn for any sign of the wounded deer. We didn’t see any evidence. No blood, hair or any other sign of a wounded animal. Not sure what to do next, Dad suggested I grab my bow and stand at the end of a section of brush while he entered to continue the search. Our idea was; that if the wounded animal was to get up and try and escape the brush-lot I would at least see it or maybe even get a shot at the wounded animal. I agreed and headed over. I knocked an arrow and waited. The ‘Music Camp.’ The remnants of the old bandstand can be seen in this satellite image. It’s important to note that this section of brush we call the ‘Music Camp’ is very familiar to Dad and me. We’ve hunted it our entire lives. The 4 acre swath got its name from the 1960’s when in its glory days the property’s former owner literally ran a music camp there. Kids would come from all over New York and points beyond to attend the camp. As of a few years ago, the old bandstand – including chairs and music stands still stood as they were left by the children decades ago. The camp is long gone and in fact resembles more of a jungle now as the brush is well above my head. The deer love it though and we love it, too because it acts as a deer sanctuary and allows them to escape the area’s heavy hunting pressure. As I stood at the end of the brush lot and watched, I was reminded of some of the previous hunts Dad and I have shared in years prior. There was that big 8-pointer I had tagged with my muzzleloader back in the early 2000’s and the time I saw one of the biggest bucks of my youth, but choked when I shot a dogwood (tree) and not the deer. And then it happened. I had glanced up to the north and I could see a large-bodied buck moving through the brush and headed to a clearing. Could the ‘Music Camp’ produce yet another magical memory? I was around 80 yards from the buck and needed to close the distance – and fast. I tucked my bow and arrow under my arm and began to run. As I edged closer and closer to the clearing, I glanced up to ensure the buck was still on his way. He was. I closed another 20 to 30 yards and waited. I could see the buck walking slowly through the brush – he was nearing the clearing and I knew the encounter was going to happen. I drew my Bowtech 101st Airborne and waited. At 22 yards, the buck stepped out of the brush. It was the moment of truth and in the game of hunting I was in the driver’s seat because the buck hadn’t detected my presence, but I had his. I waited, aimed and let the Easton arrow fly. It was a true and perfect shot as I’d hit the buck right in the boiler. He spun and ran right back into the ‘Music Camp.’ I dropped to my knees and laughed. What the heck had just happened? Unreal! ‘Bully 5’ (foreground) makes an appearance just hours prior to his face-to-face meeting with the author. Date and time clearly wrong in photo. “I’m pulling out my phone to record this because no one in the world will believe what just happened,” I said. “What,” Dad said it a surprised look on his face. “A monster just walked out of the ‘Music Camp’ and I shot him at like 20-yards,” I relied. “You’re kidding me!” “Nope!” Dad and I started hugging and acting like all hunters do when we achieve success. Dad said to me he was just thinking that every few years he and I do something so stupid and end up shooting a nice buck. He was right and we had. We decided to give the deer some time to expire and headed back to the house for a coffee and to reminisce on the morning’s events. On the way back to the house I decided to pop a card on a camera I have located not too far from the ‘Music Camp.’ I replaced the card and headed to the house. I popped the card in the computer and, as fate would have it, on this memory-filled Monday, there was he was. The buck I had just arrowed posed for that camera just hours prior. This was certainly cool and added to the hunt. He was a deer we had limited history with, but one I’d coined as the ‘Bully 5.’ This buck was a tank with a set of wacky antlers that only sported 5 points. Dad and I returned to the site of the shot and took up the blood trail. Some 80 yards later, we walked up on ‘Bully 5.’ He was down. 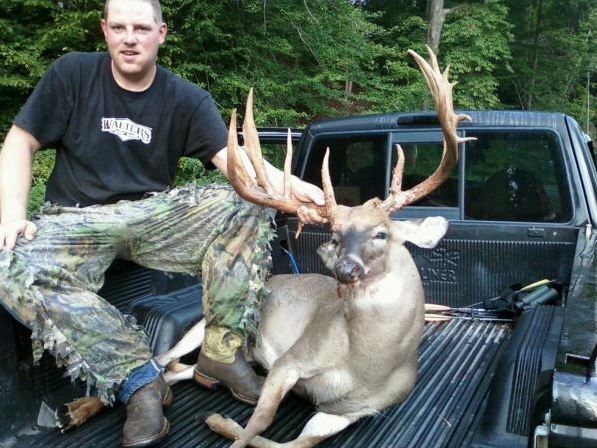 He was exactly what I thought he was – a fully mature Western New York bruiser of a buck. I was thrilled with him. After tagging ‘Bully 5,’ Dad snapped a few pictures to document the day. They turned out great, but the memories made will remain as vivid in my mind as the images captured. As it turns out, we never did find any sign of that wounded deer – and ‘Bully 5’ didn’t have any injuries to him. So that mystery remains unsolved. I do owe that motorist a ‘thank you’ though. Had he not struck that deer with his car, Dad and I would have never done what we did. ‘Bully 5’ tipped the scale at 170 lbs. The big boy proved to be too much for one of my eye bolts as it snapped in half when I was hoisting him up. What a blessed day in the deer woods of WNY.